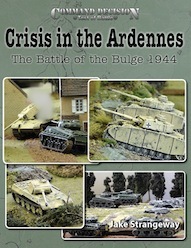 Test of Battle Games just released Crisis in the Ardennes: The Battle of the Bulge 1944. It is a campaign book for their WW2 battalion-level miniatures rules Test of Battle. ToB has been one of our Top Picks from the beginning. We haven’t seen the new book yet but the others have all been excellent and should be of interest to anyone who games in WW2 even if not using ToB. On December 16th, 1944 the German Army launched Operation Wacht am Rhein (Operation Watch on the Rhine). This operation, whose goal was to split the Allied armies and capture Antwerp, was the last major offensive launched by Germany in the West. Known as the “Battle of the Bulge” due to the shape of the German advance into Allied lines, it has secured its place in history as the largest battle fought by America in the war, and the nail in the coffin of the Wehrmacht.